A 16-year-old sneaker-loving teen is using the footwear to get a different kind of kick. He's opened a pawnshop that uses high-end athletic shoes as collateral. 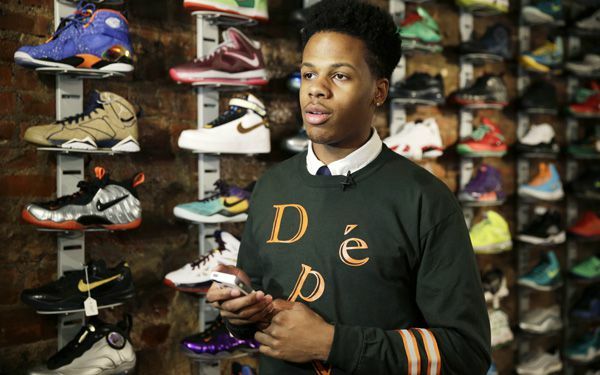 Chase Reed and his father, Troy Reed, opened Sneaker Pawn on Lenox Avenue in New York City's Harlem neighborhood, looking to capitalize on America's multi-billion dollar athletic footwear market and the high prices sneakers can get being re-sold. The idea started close to home, when Chase would ask his father to borrow money after Reed had spent a few hundred dollars on sneakers for his son. Reed would hold onto a pair of his son's shoes until he had gotten his money back. "My son said, 'Dad, you're actually kind of making me pawn you my sneakers,'" Reed said during an interview at the store. "Once he said that, a light bulb went off." The shop, which opened about six months ago, offers different options. People looking to just unload their sneakers specifically basketball shoes can offer them to the Reeds to be bought outright, or on a consignment agreement which nets the Reeds 20 percent of the final sale price. Those looking to pawn their sneakers have two months to redeem them for the amount of money the Reeds forwarded them plus a storage fee. Shoes that are being pawned are held in storage and not displayed, until the owner either gets them back or gives them up. Chase, as the sneaker aficionado, has the final say on whether they buy a certain pair from someone, and what prices they sell the shoes. He also customizes sneakers with his own art. Since he's still in high school, his father handles the running of the store during the weekdays. Personally, I think that this is great idea! I think this teenager is a very caring person, and wants the best for the population. He has done a truly great thing. i think this is a good idea to both referbish old shoes, and to sell them at a decent price. this will better than going to the store and paying $100 for a new pair of shoes. I think the idea of opening a pawn shop for used shoes that the teen and his father had is a good and relevant idea. Shoes, especially sneakers are in right now. I feel it's a good investment. I found this article interesting because hes still in high school and is already successful and a business man. It's also nice that it's kind of like a father and son business. I think its cool that he found a use for his old used shoes. And its good for him because he's making a profit. He can also express his artistic side by customizing some of his old shoes. this guy sells shoes for less than what you might find on the Internet. I think its a great idea because people cant afford whats online plus he gets 20% of the product that he is selling.